Ichtyol line contains ICHTHYOL® PALE, highly purified distillate of sedimentary rocks of marine origin from the Mesozoic Era, rich in sulfur. Due to its broad-range efficacy, Ichthyol may be used for care of problematic skin prone to acne and rosacea and in treatment of dandruff. It acts against microbiological causes of acne and dandruff, and reduces excessive sebum secretion. Also, Ichthyol soothes irritation, redness and itching. ICHTHYOL® PALE is a natural substance with a high safety factor, well-tolerated on the skin, even during long-term administration. Leaves no trace on skin and clothes. It is recommended for care and treatment of facial and body skin prone to acne, seborrhoeic dermatitis, rosacea and other inflammatory skin processes. 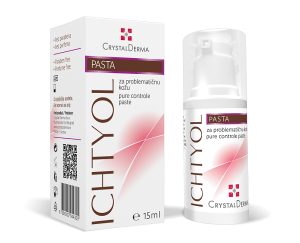 Ichtyol white cream gel may be used once or several times a day, in a thin layer onto the previously cleansed skin. Ichtyol paste is applied targetedly on changes in a thicker layer once or twice a day. It is recommended for dandruff, excessive sebum production, seborrhoeic dermatitis, scalp psoriasis. 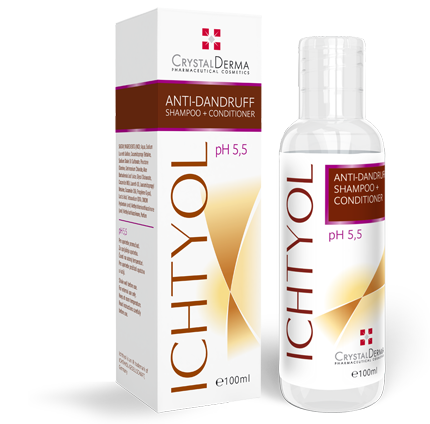 Recommended use of Ichtyol shampoo is twice a week. Apply the shampoo on wet hair and massage gently. Leave for at least 3 minutes, then rinse well. If shampoo contacts the eyes flush with water.